Star Games Casino is an adequate offering, with a lot of very enjoyable slots and some decent promotions. The welcome bonus is standard, and there are some great progressive jackpots to be won. It is disappointing that there is no live chat available, and the customer support is not 24/7. Owned by Europe Entertainment Ltd, Star Games Casino is licensed and registered in Malta, and has been since its conception in 2002. As self-proclaimed gaming lovers, Star Games Casino puts itself forwards as thoughtful, prepared and with great attention to detail. All these qualities attribute the quality slot games, and board games on their online casino. Star Games casino tournaments really make you feel part of the team, and they also guarantee secure and simple withdrawals of their gamers' winnings. Downloading Star Games Casino is not an option, but playing their games in your browser most certainly is, after a quick registration process. Stag Games Casino Greentube software and Novoline games range adds to their in house software platform and helps bring life to their range of innovative online slot games. There's the ever exciting Book of Ra Deluxe, happy Caribbean Holidays, a Dolphin’s Pearl Deluxe, the King’s Treasure and a Reel King. Star Games Casino jackpot slots are a reel treat, the more people playing, the more money there is to be won. You can play against real people on the Star Games Casino reels. While there are some table games to delight you, this is mainly a slots focused online casino. VeriSign is in use for added security, and you can track your play to ensure you are receiving the fair play Star Games Casino abides by. You'll be seeing stars with all that glitters being golden when it comes to Star Games Casino bonuses. 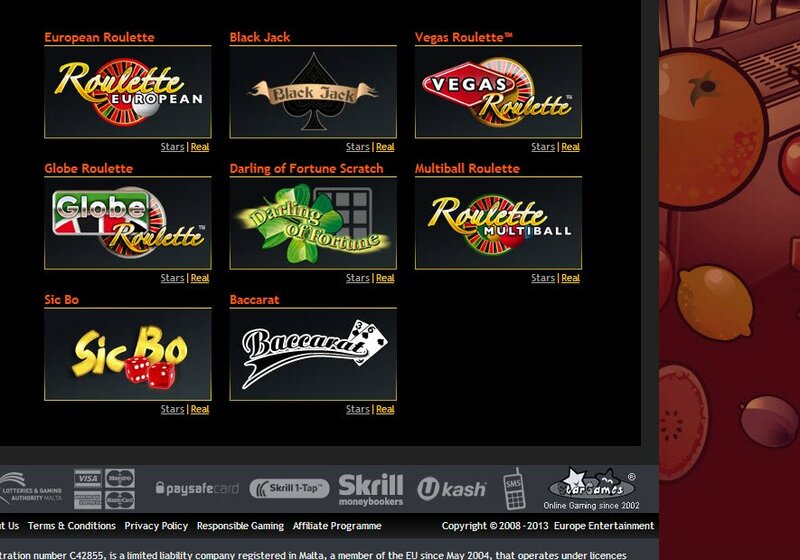 New players will receive 50% on up to a €100 first deposit welcome bonus. There's a wagering need of 25 times the bonus amount so you can safely get a return on your winnings. There's also a Star Games Casino Bonus Club that will reward you according to how much you play. There will be new and stunning bonuses every month, tailored to your particular playing style. Banking is simple and most popular deposit methods are available to everyone. Withdrawal can be slow the first time, but as soon as you have one winning Star Games Casino withdrawal under your belt, it will continue to become simpler and easier each time you go to withdraw your winnings. Customer service is not available by live chat, instead there is an email address, with staff available 14 hours a day, excluding public holidays. There are local numbers for the UK, Germany, Austria and Switzerland, all charging you for the telephonic privilege. In a rather sweet gesture, that more or less makes up for not having live chat or Freephone numbers to call them on, under their help section they have a section entitled "Smileys" It shows you how to manually combine keys to create some of the best loved and most widely used little yellow facial expressions. There's also a not so useful common abbreviations/slang list, with 11 phrases that even a non-English speaker would know well. Apart from one, online casino player specific I did learn:- nha ... Nice hand - you played well.